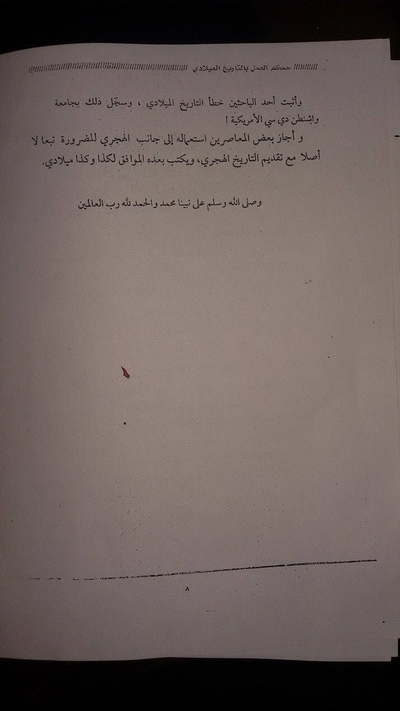 This treatise of the Diwan al-Buhuth wa al-Eftaa' (Research & Fatwa-Issuing Department), previously unseen in the outside world, concerns the question of whether one can use 'Miladi' dating, best known in its current and most widely used form as the Gregorian calendar. In short, the conclusion is that the Islamic State must ultimately erase all traces of Miladi dating as it is a system of dating associated with the disbelievers, in particular the Christians. On the basis of the principle that one must not imitate the disbelievers, one should not use Miladi dating. Rather, the system to be followed is the 'Hijri' dating, which begins from the time of the migration [hijra] of the Prophet from Mecca to Medina [c. 622 CE] and follows the Arabic lunar calendar. However, as with the concept of tribal organization of society, there is some clash between reality and theory. 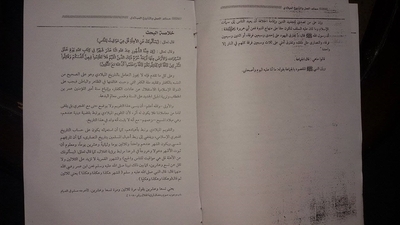 As Miladi dating has become so widespread, one often finds Miladi dating used in Islamic State administrative documents, but the convention is that it must be written after the Hijri dating, usually in the form of Hijri date, corresponding to the relevant Miladi date. This practice is briefly alluded to at the end of the treatise. 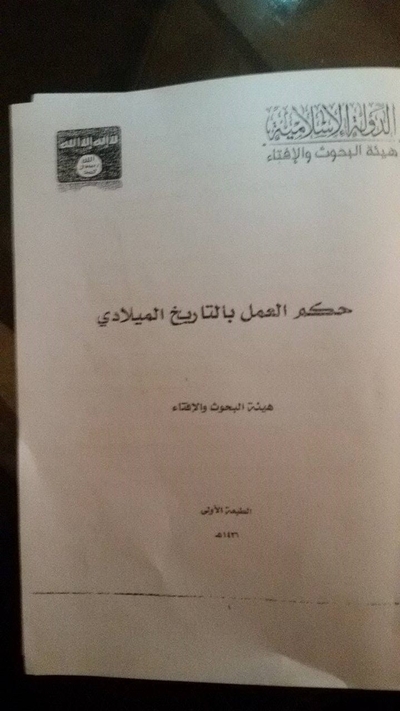 Even so, one can find exceptions to this convention in the corpus of available Islamic State documents. 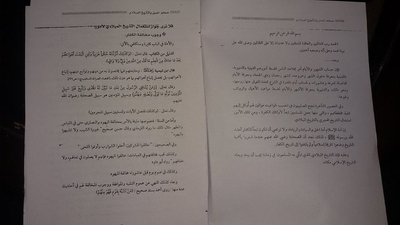 For example, for academic year 2014-2015 in Ninawa province primary schools, the Miladi dating is used for exam timetables without mention of Hijri dating (Specimen 2E). This may partly have to do with the fact that the Islamic State considered the 2014-2015 academic year transitional in nature in terms of bringing the education systems in the territories it controls in line with its ideology through securing repentance of teachers and staff, issuing a new set of textbooks etc. In terms of the analogy with tribes, in theory Islamic State ideology demands that tribal identity must be done away with, but because a major tribal rebellion within the heartlands of the Islamic State's territory would pose an existential threat to its rule, in practice the Islamic State must display a degree of pragmatism, and in this regard even has a bureaucratic department (Diwan al-Asha'ir) to deal with tribal affairs in areas such as Raqqa and Deir az-Zor provinces in Syria. Keeping true to major ideological influences, Ibn Taymiyya features prominently among theologians and commentators cited in this treatise. I have translated the entire text below, inserting explanatory notes in square brackets and occasional hyperlinks where appropriate. Note that the page numbering on the original counts the cover of the mini-book as the first page. I have followed this numbering. Praise be to God the Lord of the Worlds and good tidings be upon those who fear Him, and there is no enmity except upon the wrongdoers. And God bless our Prophet Muhammad and all his family and companions. The reckoning of months and days is something people need to keep track of their religious and worldly affairs, for the religious in knowing the entry and exit of the month, like the month of Ramadan and the month of Dhu al-Hijja, and to know the distinguished days like Arafat and Ashura, and for reckoning days determined in law like the length of a woman's waiting period after the death of her husband, and the like; and for worldly affairs in knowing the days and months to keep track of appointed days for work, salaries and other things besides those. Indeed the Ummah of Islam is an ummah of Truth, sovereignty and will, and it is not content with being followers of the disbelievers, the enemies of God and His Messenger (SAWS), and thus finds that the Companions, may God be pleased with them, when they realized the important of dating, put in place an Islamic dating system and did not assent to the dating of the disbelievers. Thus the Miladi dating that the Muslims have adopted in our time must be removed and Islamic dating must take its place. For we do not consider it permissible to use Miladi dating for affairs.
. The obligation of differing from the disbelievers. The evidence from the Book: the Almighty has said: "And thus We have revealed it as Arabic legislation, and if you should follow their whims after what has come to you of knowledge, you will have no ally or helper before God" [Qur'an 13:37]. Ibn Taymiyya (may God have mercy on him) said: "And following them in what they specify from their religion and the dependencies of their religion is adherence to their whims; but also it becomes following their whims in matters besides that" (Iqtida' al-Sirat al-Mustaqeem- p. 99). And the Almighty has said: "And whoever opposes the Messenger after what has been made clear to him from guidance and follows a path besides that of the believers, We will turn him to what he has turned, and We will confine him to Hell" [Qur'an 4:115]. And the path of the believers is the path of the Companions, may God be pleased with them. And the Almighty has said: "Thus We detail the verses and thus the path of the criminals is clarified"- [Qur'an 6:55]. As for the Sunna, you will find it filled with the order to differ from the Jews and the Christians even in dress and appearance. For example, what al-Tirmidhi narrated and deemed of sound authenticity: "Dye grey hairs and do not imitate the Jews." And in the two Sahih collections: "Differ from the mushrikeen: trim the moustache and let the beard grow." Similarly one must differ from them in acts of worship: "Differ from the Jews, for they do not pray in their sandals or shoes"- narrated by Abu Dawud. And likewise has come the prohibition on the general principle of imitation and agreement as well as the obligation of differing from them in a number of hadiths, including: what Ahmad narrated on authentic transmission: "Whoever imitates a people is one of them." And it has also been narrated on the authority of Shaddad bin Aws: that the Messenger of God (SAWS) said: "The sparks of this Ummah will surely follow the customs of those who came before them- the people of the Book- just as one arrow resembles another." Al-Bukhari said: "The section on dating, from where did they begin to chronicle dating?" On the authority of Sahl bin Sa'ad: he said: "They did not reckon from the sending [beginning of prophetic mission] of the Prophet (SAWS) or from his death. They have only reckoned from his coming to al-Medina [the Hijra]." And Ibn Hajr said about dating: "That was in the Caliphate of Omar. And al-Suhaili affirmed that the Companions took dating by the Hijra from the Almighty's words- "Truly a mosque founded on piety from the first day" [Qur'an 9:108]- because it is well known that it is not the first of the days absolutely, but rather it has been indicated as having been added to something implied, as it is the first time in which Islam was glorified, and in which the Prophet (SAWS) worshipped his Lord safely, and beginning from the building of the mosque, the opinion of the Companions has agreed on the beginning of dating from that day." And Ibn al-Athir said: "And the known truth is that Omar bin al-Khattab- may God be pleased with him- ordered to place dating and the reason for that is that Abu Musa al-Ash'ari wrote to Omar that "letters come to us from you without dating." So Omar gathered people for consultation. Some of them said: "Chronicle from the sending of the Prophet (SAWS)." Others said: "From the migration of the Messenger of God (SAWS)." And Omar said: "Rather let us chronicle from the migration of the Messenger of God (SAWS) for his migration is the division between Truth and Falsehood." Al-Sha'abi said: and Muhammad bin Sirin said: "A man came up to Omar, and said: "They have devised a system of dating." And Omar said: "On what basis have they chronicled?" He said: "It is something the non-Arabs do in distinguishing such and such month from such and such year." So Omar said: "Fine." So they devised a system of dating and they agreed on the Hijra, and then said: "Beginning from which of the months?" So they said: "From Ramadan." But then they said: "But Muharram is the departure of the people from their Hajj [Hajj is performed in Dhu al-Hijah- the preceding month] and is a month of sanctity." So they agreed on it" (al-Tashabbuh al-Munhi Anhu- pp. 543-544). "This verse shows that rulings on acts of worship and other things besides them are construed such that it should be according to the months and years that the Arabs have acknowledged, not those considered by non-Arabs, the Byzantines and Copts even if there is no addition to the 12 months, because they constitute a variety of numbers of days, some exceeding thirty and others falling short, while the months of the Arabs do not exceed 30 days even though some fall short of that." And the Sheikh of Islam Ibn Taymiyya said as well: "As for non-Arabic talk and the naming of their months with non-Arabic names, Abu Muhammad al-Karamani- the one called Harb [a Hanbali scholar]-said: "The section on calling months in Persian: I said to Ahmad [ibn Hanbal: founder of Hanbali school of jurisprudence]: "[Did you know] the Persians have days and months that they call by names that are not known?" He really hated that and in that regard narrated a hadith from Mujahid: that he regarded it as makruh [hated: i.e. disliked but not absolutely forbidden] that the words 'Adharmah' and 'Dhi Mah' should be said- Persian names of months. I said: "What if it is the name of a man by which I am to call him?" He hated that." (Iqtida' al-Sirat al-Mustaqeem- p. 518). And Ibn Taymiyya also said: "The predecessors [people of al-Salf] continued to hate altering the rituals of the Arabs even in dealings, and that is- speaking in a language besides Arabic- except out of need as Malik [founder of Maliki school of jurisprudence], al-Shafi'i [founder of Shafi'i school of jurisprudence] and Ahmad specified in that matter. Indeed Malik said: "Whoever speaks in a language besides Arabic in our mosque, expel him from it"- (Collection of Fatwas- 255/32). The Companions- may God be pleased with them- gathered and engaged in consultation when they saw the need for dating, and they never suggested a scenario of adopting Miladi dating, but rather agreed that the Muslims must have a system of dating differentiating from others besides them, and that it should be a system of dating for the Ummah of Islam. And no one is allowed to violate it, and it is not allowed to bring a system of dating besides what they put in place. Had it been permissible to deal in Miladi, there would have been no need for the Companions to gather to choose one besides it. And what is in the Miladi dating from religious symbols signifying the glorification of the birth of al-Masih [Christ], which has not come to be distinguished in our law from the rest of days, is not hidden. Similarly it is not hidden: what is in adopting Miladi dating regarding imitating the disbelievers, educating people on the basis of following the disbelievers, and glorifying the feast days of the disbelievers and their innovative systems of dating. As for the one who invokes necessity, there is to be no concession to him in that regard, for the Hijri system of dating is the one considered authentic on which the Ummah has relied since the convention of the Companions- may God be pleased with them. As for the one who has resisted the renewal of the religion and the establishment of the Caliphate, people must refer [him] back to the features of Islam and what has been the precedent set upon it that it [the Caliphate] should truly be upon the Prophetic methodology. For on the authority of Abu Huraira (may God be pleased with him): that the Messenger of God (SAWS) said: "The Jews are divided into 71 sects, the Christians similarly 72 sects, and my Ummah will be divided into 73 sects. All of them will be in Hellfire except one." They said: "Which one is that?" He said: "The Jama'at." And the Prophet (SAWS) clarified the meaning of the Jama'at by these words of his: "What my Companions and I belong to today." The Almighty has said: "They ask you about the new moons. Say: 'These are markings of time for the people.'" [Qur'an 2:189]. The Almighty has said: "The number of months with God is twelve in the Book of God from the day He created the heavens and the earth, of which four are sacred. That is the correct religion. So do not wrong yourselves in them and fight the mushrikeen as a whole just as they fight you as a whole. And know that God is with the pious" [Qur'an 9:36]. 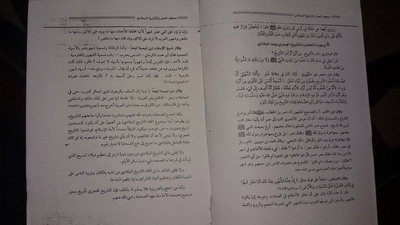 According to all that has been presented, it is not allowed to deal in Miladi dating as it truly constitutes imitating the disbelievers and following the path of disbelief that it has been obliged to differ from outwardly and inwardly, so the Islamic State must be independent from the customs of the disbelievers, and follow the Sunnah of the Amir al-Mu'mineen Omar bin al-Khattab and educate the new generation on the Sunnah and do away with signs of innovation. And the first principle- and God knows best- is that this calendar must be forgotten and not inserted even alongside the Hijri one but rather must be done away with entirely in our dealings such that there should be no trace of it, because the Miladi calendar is connected with the religious cause among them, and that is the birth of al-Masih- so they claim- despite the fact it is not established that he was born on this date. Also its use takes precedence over the reckoning of the Islamic Hijri dating, leading to the connection of the generations of the Muslims with the dating of the Christians. Further, their dating is solar and the month among them may be 31 days or 28 days, and it is well known that establishment of the entry and exit of the months in our law is connected with the observation of the new moon, just as the Almighty said: "They ask you about the new moons. Say: 'These are markings of time for the people and the Hajj." And the lunar months do not exceed 30 days, and do not fall below 29 days, as made clear by our Prophet (SAWS). For on the authority of Ibn Omar (may God be pleased with them both): 'The Prophet (SAWS) said: "The month is like this, this and this"- meaning 30 days- and then he said: "Like this, this and this"- meaning 29 days, at one time 30 days and at another time 29 days'- (transmitted by Muslim in Fasting: Section on the Obligation of Fasting in Ramadan according to Observation of the New Moon No. 1080). And one of the researchers established an error in the Miladi dating, and recorded that in the American Washington DC University! But some of the contemporaries have allowed for it to be used alongside the Hijri date for necessity following on from and not the original with the presentation of the Hijri date. And it is written after it thus: Corresponding to such and such Miladi. And God's peace and blessings be upon our Prophet Muhammad and praise be to God the Lord of the Worlds.